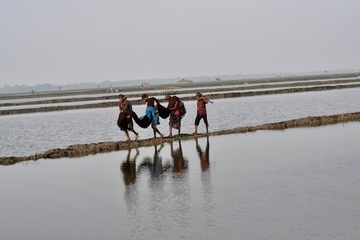 In Bangladesh, the Government, along with International financial and multinational organisations specialised in fish farming such as the Food and Agriculture Organization (FAO), promoted and introduced shrimp farming as a commercial activity that can raise the economic status of the country. Shrimp industry became the second largest foreign currency earner after garment production. However, the increase in shrimp aquaculture farms, which has resulted in the destruction of entire natural ecosystems and local economies based on agriculture and fishing, faces opposition from local communities and environmental organisations. As for instance, the salinisation of the soils decreases the fertility of the agricultural lands and it also provokes health problems among the population. The Environmental Justice Foundation, based in London, has also been denouncing for years the poor working conditions of the shrimp farms’ operatives. Still the trend in favor of this industry remains sustained by the collaboration between Bangladesh authorities and international organizations. In 2015, the Bangladesh Department of Fisheries together with the FAO announced a new project development of $ 38 million for increasing the saline water availability in shrimp enclosures « in Khulna, Satkhira, Bagerhat and Cox's Bazar districts ». Project Details An annual production of 58,000 tons and a 10.8 million people work force. Increases of up to 500 percent in levels of soil salinity. Development of Alternatives The stop of the shrimp farming and the restoration of the area, giving back the lands to their initial owners. Why? Explain briefly. The shrimp farming is still the main economic activity in Bangladesh. Although the Government enacted a law, in September 2000, prohibiting the indiscriminate collection of shrimp larvae, illegal collection in rivers and coastal areas of the country continues every year.